If Christ Church receives the same financial gifts in 2018 that it received last year, our ability to improve our ministry to students would be negligible. Our impact is directly related to your generosity. We have a three-tiered financial goal—$750K, $1M, and $1.25M. If we display extra generosity we should be able to achieve at least $750K. 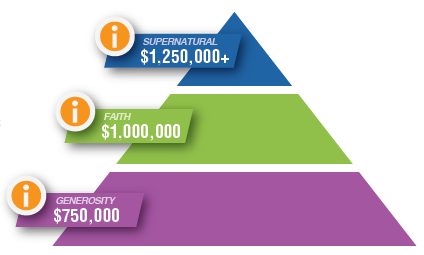 An exceptional faith in God would raise $1M for the 4RStudents Movement. If a supernatural miracle in giving occurs then we’ll exceed the $1.25 million goal in one year’s time (April 2018 through March 2019). If we surpass our goal of $1.25 million, please visit www.ChristChurchUSA.org/4RStudents to learn about our extended “Hope List” 4RStudents. Note: Our prayer and hope is for the entire congregation to participate in the financial aspects of the 4RStudents Movement! Remember it’s not equal giving, but equal sacrifice.